Skybus LLC/ Global GSE stocks a variety of aircraft ground power units (GPU). If you do not see what you need here, please contact us as we have new stock arriving weekly. Used Stewart and Stevenson TM4750 Aircraft Ground Power Unit (GPU). 75 KVA. The aircraft gpu will be fully serviced, load bank tested, and freshly painted prior to shipment. Used Hobart 90G20P 90 KVA aircraft ground power unit. The aircraft gpu will be fully serviced, load bank tested, and freshly painted prior to shipment. Used Stewart & Stevenson TM4900JD 90 KVA Aircraft Ground Power Unit (GPU) with 3 phase 115/200 volt 400 Hz AC power has 7,643 hrs and will be fully serviced, load bank tested, and freshly painted prior to shipment. 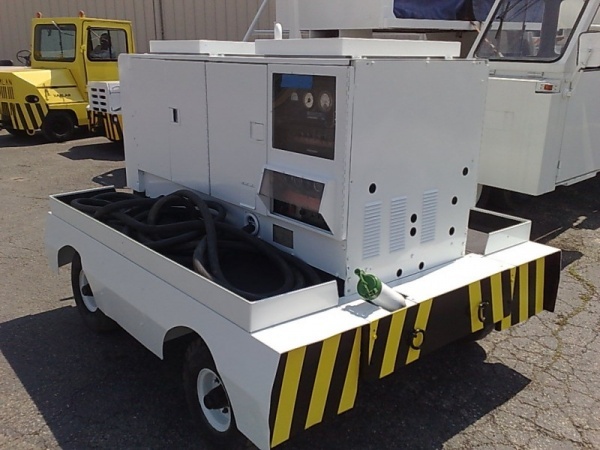 Used Jet Ace Diesel Aircraft Ground Power Unit (GPU). 90 KVA with 654 hrs listed on the meter. S/N ACE-4090-JDP28. The aircraft gpu will be fully serviced, load bank tested, and freshly painted prior to shipment.